Elm Street Quilts is not directly affiliated with Project Linus. The blog post includes photographs of a quilt that I am donating to Project Linus. The objective in the series of Elm Street Quilts Hugs blog posts is to encourage the giving of handmade to someone who needs extra support. This could be a family member or friend or perhaps to someone in your community. 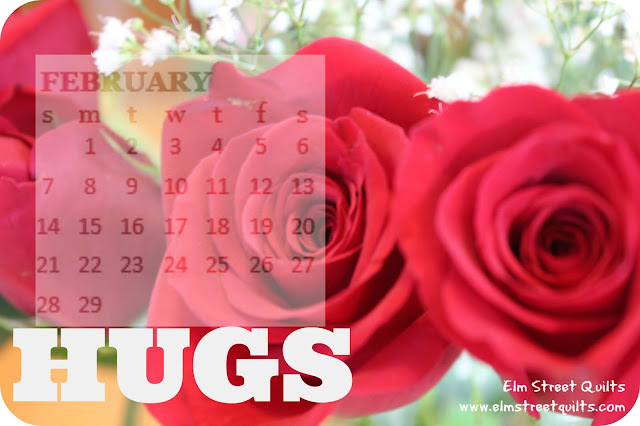 I'd like to turn February into a month of giving handmade hug. #handmadehug #ESQHugs. I'd encourage anyone to write a blog post or Instagram or Facebook on an organization you support with your #handmadehug giving. Link it back with the social tags #handmadehug #ESQHugs, the blog linky party (here) or ESQ Facebook so we can all learn about opportunities to make a difference. With this post and others, my goal is to raise awareness of organizations that collect and distribute handmade items to people in need. Project Linus may be the most recognized organization for distributing donated quilts to children and their web site celebrates the over 5.7 million donation quilts since 1995! Project Linus is a non-profit, all volunteer organization that brings quilts and blankets to seriously ill and traumatized children in your local area. All sorts of blankets and quilts are needed. Information on how to donate locally in the US here. You could also check with your local quilt guild. There are 280 chapters of Project Linus in the US. Susan Holmes, founded my local NC Project Linus chapter in 1996 and is the chapter's coordinator. Susan graciously answered some questions for me via email. Project Linus is a wonderful organization because it's really just about people who care about kids in their community and want to ease their pain a little. We make and bring handmade blankets to seriously ill and traumatized children in the area and to children of deployed and fallen military personnel from Fort Bragg. We all do whatever we can to help. Some folks make blankets, some folks pick up from drop sites, some folks donate funds. It is encouraging to realize that there are so many goodhearted people all around us. In my community here in North Carolina, over 32,000 quilts (almost 3,000 of those in 2015) and blankets have been delivered to local agencies that help seriously ill or traumatized children who need a hug. Agencies include local hospitals and groups supporting children who are going through a difficult time. The quilt or blanket maker should donate the quilt and secure their name and address on piece of paper to the quilt with a safety pin. Before delivery, the Project Linus team will sew on a fabric tag that says "Made with tender, loving care for Project Linus." At least in my local chapter, the paper with the makers name remains on the quilt or blanket when donated to the local organization. All blanket styles are welcome, including quilts, tied comforters, fleece blankets, crocheted or knitted afghans, and receiving blankets in child-friendly colors. Always remember that blankets must be homemade, washable, free of pins, and come from smoke-free environments due to allergy reasons. Cash donations are also accepted. Before making a quilt for donation to Project Linus or any other organization, be sure to visit the organization's web page to make sure you understand what is required. Are there restrictions on materials used? Are there size requirements? Understanding mailing instructions or drop off requirements are also important. In addition to quilts, organizations often need funding for the postage required to get the quilts to where they are most needed so consider a cash donation as well. I recently finished my Project Linus donation quilt (pictured in this post) using a disappearing 9 patch pattern and some really cut fat quarters that were in my stash. Have you made a quilt for Project Linus? Tell us about it in the comments or write a blog post and share at the Hugs linky. My granddaughter (7 yrs at the time) dropped an electric hot water pot on her foot. She was treated at the hospital and was given a Linus fleece blanket she held that blanket and cried into it. Now that girl still has her blanket her foot is healed ( 2&3 degree) no permanent damage. That blanket was such a wonderful gift for her that day and continues to be her "comfort"
XO - Be my Valentine!